Lotto 6/49 offers two prizes for each draw - the regular jackpot that starts at $5 Million, plus the GUARANTEED $1 Million Prize every draw. And remember to say “YES” to the $1 Extra for the chance to win $500,000. Draws happen every Wednesday and Saturday night after 7:30 pm PT. 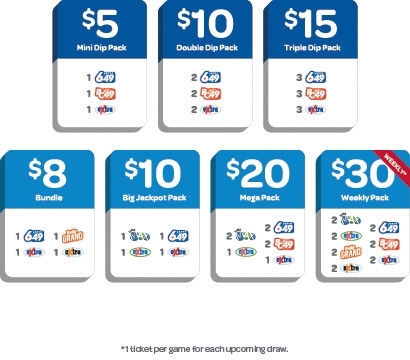 Each $3 play gets you one set of 6 numbers from 1 – 49, plus a bonus number. Choose the set of 6 numbers yourself, or ask for a Quick Pick to have a random set of numbers chosen for you. The bonus number is randomly selected for you. Your $3 ticket also automatically gets you one 10-digit number for the GUARANTEED $1 Million Prize draw. Say "YES" to the $1 Extra for the chance to win $500,000. The main jackpot starts at $5 Million and the GUARANTEED $1 Million Prize is available for every draw. The top Extra prize is $500,000. Main prize: match all 6 of your numbers to the 6 numbers drawn. GUARANTEED $1 Million Prize: match your 10-digit selection exactly to the selection drawn and you’re our next millionaire! Extra: For the top Extra prize, match all four of your numbers (between 1-99) to the numbers drawn and win! More on the prize structure and odds of winning. When you play Double Play, your regular selections are eligible for both Lotto 6/49 and BC/49. Each Double Play costs $4. Check out our line-up of packages. They are a great way to play different combinations of Lotto 6/49, BC/49, DAILY GRAND, Lotto Max, and the Extra in one quick, easy transaction. Packages are available at Retail Locations as well as online a PlayNow.com. 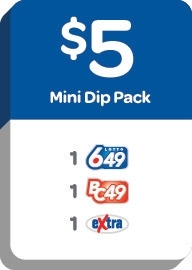 A $5 Mini Dip package consisting of one Lotto 6/49 play, one BC/49 play (same six numbers as the Lotto 6/49 regular selection), plus one play of Extra. Advance Buy is available, up to a maximum of 26 consecutive draws. Additional Extras are available at a cost of $1 per play, up to a maximum of 9 per ticket. 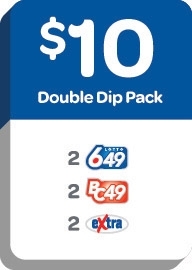 The $10 Double Dip Pack is a Quick Pick package consisting of two plays of Lotto 6/49, plus two plays of Lotto 6/49 Extra and two plays of BC/49. Advance Buy is available, up to a maximum of 26 consecutive draws of Lotto 6/49 and BC/49. Additional Extras are available at a cost of $1 per play, up to a maximum of 8 per ticket. 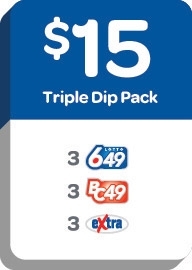 The $15 Triple Dip Pack is a Quick Pick package consisting of three plays of Lotto 6/49, plus three plays of Lotto 6/49 Extra and three plays of BC/49. Advance Buy is available, up to a maximum of 26 consecutive draws of Lotto 6/49 and BC/49. Additional Extras are available at a cost of $1 per play, up to a maximum of 7 per ticket. 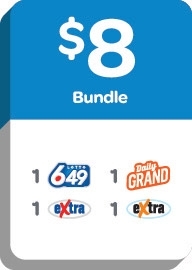 The $8 Bundle consists of one Lotto 6/49 and Lotto 6/49 Extra, one DAILY GRAND and DAILY GRAND Extra. Advance Buy up to a maximum of 26 consecutive draws is available for purchase at retail locations. Additional Extras are not available on the $8 Bundle. 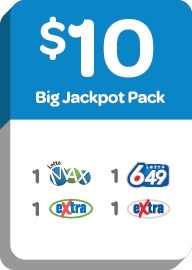 The $10 Big Jackpot package consists of one Lotto Max, one Lotto 6/49, one play Lotto Max Extra and one play of Lotto 6/49 Extra. Advance Buy is available, up to a maximum of 26 consecutive draws of Lotto 6/49 and Lotto Max. Additional Extras are not available on the $10 Big Jackpot Pack. 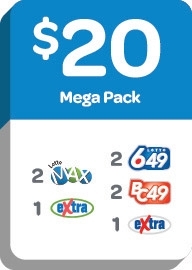 The $20 Mega Pack is a Quick Pick package consisting of two plays (6 selections) of Lotto Max, plus one play ofLotto Max Extra; two plays of Lotto 6/49, plus one play of Lotto 6/49 Extra and two plays of BC/49. Advance Buy is available, up to a maximum of 26 consecutive draws of Lotto 6/49 and Lotto Max. Additional Extras are not available on the $20 Mega Pack. Combo Play is the easy way to play multiple selections of Lotto 6/49, or both Lotto 6/49 and BC/49. Choose from a 5, 7, 8, and 9 number Combo. With Combo Play, you can choose your own numbers or ask for a Quick Pick to have random numbers chosen for you. For every six number regular selection you will receive one GUARANTEED Prize Draw selection. For example: When you choose Combo 7 you receive 7 Regular selections and 7 Guaranteed Prize Draw selections. Be sure to say “Yes” to the Extra for a chance to win $500,000. You can play up to 10 Extra on your Combo Play ticket. When you choose Combo 5, you pick five numbers, and every other number from 1 - 49 is added to create every possible six-number selection. Here’s an example of the 44 selections created when you choose the numbers 1, 2, 3, 4 and 5 on a Combo 5. When you choose Combo 7, 8, and 9, your numbers are combined into every possible selection of six numbers. Here is an example of the seven six-number selections created when you choose the numbers 1, 2, 3, 4, 5, 6, and 7 on a Combo 7. Combos 8 and 9 are created in the same way as Combo 7. Although your Combo Play ticket will only show your numbers, your ticket is eligible for all possible six-number selections. Learn more about all the prizes you could win with Lotto 6/49 Combo Play.